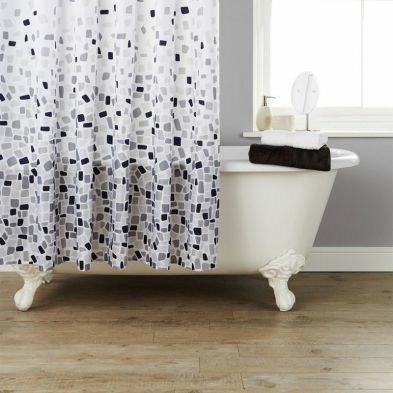 Refresh and revitalise your bathroom with this practical yet stylish shower curtain. Made from 100% polyester means it is easy to care for and is fully machine washable. Supplied with shower curtain rings for quick and easy installation. Dimensions: Approximately 180 x 180cm. Machine Washable – Please follow care label guidance. 1 x Shower Curtain supplied only.Explore more of our range, we have a huge variety of products in stock. Have a query or can’t find something you’re looking for? We receive new deliveries every week, so if the item you wish to purchase is currently out of stock, please contact our Customer Services Team and we may be able to reserve the items you require.Features:Essential bathroom accessoryDimensions: approximately 180 x 180cmMachine washableMade from 100% water repellent polyesterSupplied with curtain rings to enable easy fitting 1 shower curtain supplied onlyExcellent value for money!